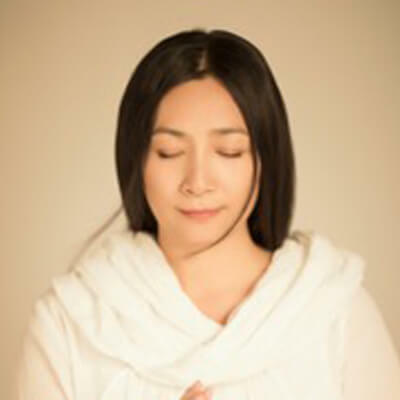 The soothing and meditative chanting of Mystic Voice stems from a deep spiritual connection to the ancient texts that inspire her music, such as the Tao Te Ching, the Buddhist Sutras, the Sanskrit Vedas or Rumi, the Persian poet and mystic. Mystic Voice’s healing voice and unique interpretation of those sacred words of wisdom infuse them with meaning and power, felt strongly by listeners from across the globe, even without understanding a single word. She has been singing since childhood, but launched her musical career just 12 years ago. Graduate of Tsinghua University in Beijing and MSc in Engineering from Stanford University in California, Mystic Voice returned to China to become a leading international consultant in cross cultural communication and business cooperation between China, the West and the Middle East, opening many relationships and establishing successful collaboration between governments, businesses and people, assisting China’s integration into the global community. However, her creative spirit and commitment to art as a healing, unifying force so urgently needed in today’s world, led her in 2006 to start her Journey of Harmony Project, a series of concerts, workshops and cultural events across China and the whole world, promoting dialogue and harmony of the cultures and nations to restore the collective consciousness to Wholeness, connecting to the spiritual nature of humanity, merging into a new harmonious world culture. She chants in different languages: Chinese, Persian, Sanskrit, and English, leading people from different cultures into a space of Oneness, immersing them in a transcendental spiritual journey to Love, Truth and Beauty. Multi talented, she is a scholar on religion, a writer, a creative artist, a master of Tai Ji, an inspirational speaker and Virtues educator. She is a new voice and image of China in the international community, an inspiration to the current Spiritual and Cultural Renaissance Movement in China. In addition to numerous concerts in China, including in China National Theatre (2012), the Opening of Asia Expo (2012), Beijing’s Bird’s Nest National Stadium (2015), the UN Women’s Day (2016), the UNESCO World Peace Festival (2017), New Healing Festival (2018), Mystic Voice traveled extensively, presented and performed in India, Israel, Europe, Japan, Congress of Korea, the Parliament of Peru and the Great Church of England, etc.. She was chosen by the Ministry of Culture of China to represent China in the first China Art Festival at Cannes, France (2014) and named Master of Chanting by the China Education Network Television (2017). Her chanting of Tao Te Ching was on the New Year’s Eve Show on China’s national TV (2018). Mystic Voice collaborates with leading musicians and artists from different nations, traditional, classic and modern, bringing together distant cultures and creating harmony and unity. She has recorded 9 albums. Her chanting was praised by prominent artists and scholars as “A Soul Penetrating Voice from Heaven”, “Divine Flute”. Currently she is based in Jeju – the Island of Peace, located in the East Sea between China, Korea and Japan. From here she travels frequently to China, Israel, Europe and US, continuing to spread the message of love and unity. With her Korean team she is planning the 1st Sacred Chanting Festival at Jeju Stone Park, a sacred ground hovered by the spirit of Seolmundae Halmang (Mother of creation) guarded by 500 Stone Generals, creating a deep meditative space in nature, a performing stage and melting pot for the visionary thinkers, musicians and artists, healers and change makers from East and West to come to ONENESS.